I have mentioned this several times before, but my husband loves spicy food. He is the creator behind my Homemade Sriracha Sauce and my Homemade Salsa. I am not a fan of spicy food at all. This roasted jalapeno hummus recipe is all his creation and it really does have a kick! Very simple to make as well. Roasting the jalapenos adds a deeper level of flavor. 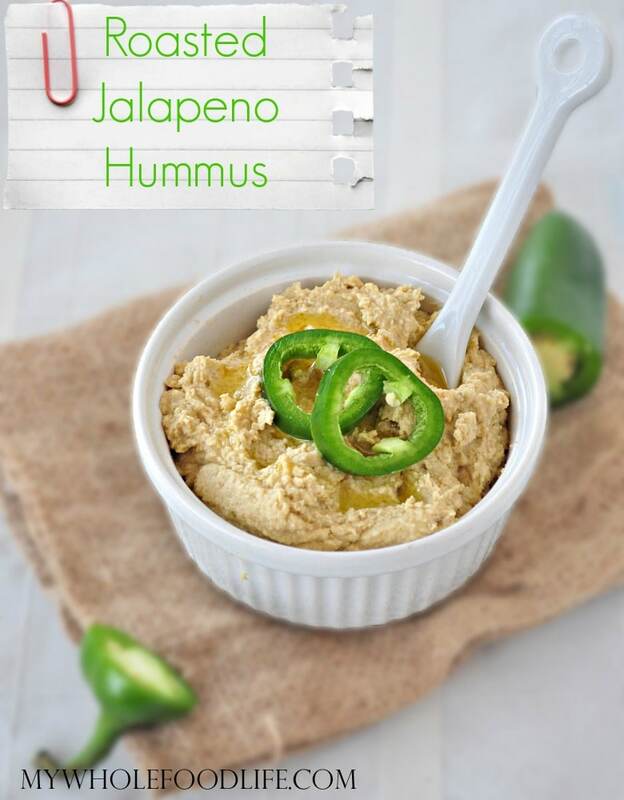 This roasted jalapeno hummus would be great with my Homemade Wheat Thins or my Copycat Mary’s Gone Crackers. If you wanted to make a big batch of thise hummus, you can freeze some for quick snack ideas on those busy days. A healthy snack with a kick! Roast the jalapino whole for 10 minutes, stopping halfway through to flip it. Slice it once it's finished cooking. You also may want to let it cool a bit. Add everything to the food processor and blend until smooth. If the mixture seems too thick for you, you can always add a little extra water or olive oil until you reach a desired consistency. If you like things extra spicy, you can leave the seeds on the jalapeno. If you don't like as much of a kick, you can remove the seeds from the jalapeno. This hummus should last a couple weeks in the fridge. Enjoy! You are so welcome! I hope you enjoy the recipe. Thank you! It is sad that this country has such a skewed idea of what healthy is. I followed this recipe to the letter, and the result was good, but WAY too lemony. Not sure if my lemons were bigger or maybe extra juicy or if the lemon combined with the jalapeno somehow made it all seem super acidic or what. Sooo ... I ended up doubling everything else. So basically it was a double batch with the juice of 2 lemons, and one whole roasted jalapeno, no seeds. It turned out very nice & I got compliments at the potluck where I took it. I will make this again, thanks!